Which should you spend money on? Many think once you have a family, a sensible MPV is your best option for practical transport. But if you still want to have some fun behind the wheel and have a growing family, what are your options? For some, estates are all the car you’d ever need. Most offer plenty of space for the family and the associated buggies, bags and baby seats, but they also need to be cheap to run, reliable and easy to drive. We’re adding an extra piece of criteria for this list, though – driving fun. Buying sensible doesn’t mean you can’t have a bit of fun behind the wheel, so these estate cars are not just sensible choices, but ones that’ll put a smile on your face on a twisty country road too. BMW is known for building fun-to-drive cars, and the sensible version of the 3 Series doesn’t lose any of its sparkle in becoming more practical. You can have as much or as little fun as you like in the 3 Series Touring thanks to a huge range of petrol and diesel engines and the availability of different driving modes. A particular highlight is the 335d xDrive that produces a huge 313hp and 630Nm of torque. 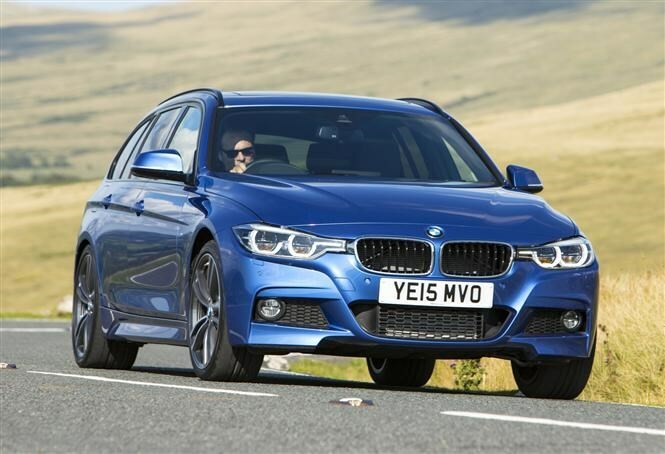 The xDrive all-wheel drive system provides amazing levels of grip, although we think the more sensible 2.0-litre 320d is the best option for most. It’s just as fun to drive and boasts attractively low running costs, proving that having fun doesn’t need to cost the earth. You can also opt for xDrive all-wheel drive across the range if you want. It’s got plenty of space and some neat touches including 40:20:40-split folding rear seats and an electric tailgate. The latest Audi A4 Avant is by far the most involving model to date. It's got a wide range of turbocharged petrol and diesel engines to choose from and there are various driving modes you can tinker with to get the most out of the car. The boot is big at 505 litres, while there's enough room inside for the family. We're particularly impressed by the range-topping 3.0 TDI with 272hp that we're currently running, offering up serious performance and impressive running costs - although it's not the cheapest to buy. Equipped with Quattro all-wheel drive, the A4 grips and grips in corners, too. The Skoda Octavia is by no means the most exciting car to look at or drive in standard specification. It's an incredibly competent car and a brilliant family runaround, but it doesn't set your pulse racing. 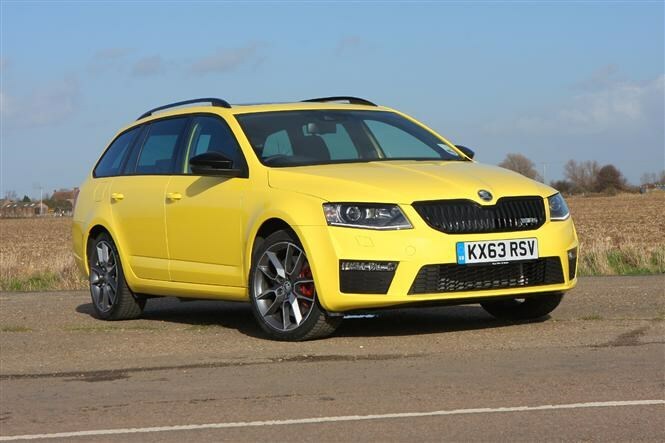 Skoda has the answer to this problem though, with the Octavia vRS. The vRS is available with either a 220hp 2.0-litre TSI turbo petrol or 184hp 2.0-litre TDI, both of which provide punchy performance and reasonable economy at the same time, while a faster vRS 230 was recently added to the range along with the option of four-wheel drive. It's great in the corners, too, feeling balanced and sharp. There are some suitably aggressive cosmetic differences over regular Octavia models, but the vRS retains the huge 610-litre boot space and roomy cabin. If you want a fast, fun estate car, you may as well do it properly. 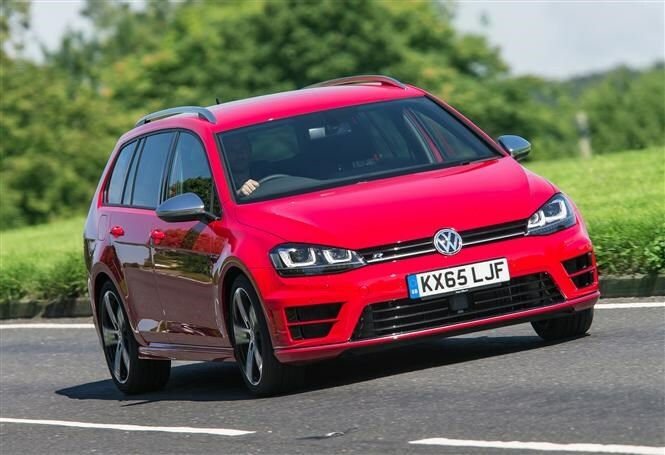 While the Golf GTD Estate provides decent performance and low running costs, the Golf R is the option if you're not as bothered about the latter of those two things. The 2.0-litre turbocharged petrol engine produces 300hp with power sent to all four wheels, so it feels incredibly fast, but also incredibly planted on the road. There's a huge 605-litre boot and plenty of passenger space so the whole family can come along for the ride. The Mazda 6 is living proof that you don’t have to spend more to have more fun. The 6 Estate offers great value for money: it’s spacious – it boasts a 506-litre boot – it’s well-equipped and the diesels should prove to be pretty cheap to run, too. There are some neat touches that will appeal to family buyers, including split-folding rear seats that can be operated from the boot via a simple catch, the load cover can be stored beneath the boot floor and there's a generous amount of storage areas throughout. On the road, the 6 provides engaging, composed handling in corners and the steering feels very precise. All models benefit from the same enjoyable driving experience, but the higher-powered diesel really makes the most of the car’s talents, although it's expensive at more than £27,000. We’d still go for the lower-powered diesel because of the blend of price, performance and low running costs. The SEAT Leon ST may be based on a car smaller than the Mazda 6, but it actually boasts an even larger boot, at 587 litres, so it’s a great option for buyers looking for style and space. It’s a wide and practical load space, too, with levers in the rear to lower the back seats. There’s a huge range of turbocharged petrol and diesel engines to choose from, including a 2.0-litre TDI diesel with 184hp (it’s the same engine found in the VW Golf GTD and Skoda Octavia vRS), but if you want to have the most fun, there’s a Leon ST Cupra with a 290hp turbocharged petrol engine and a boisterous bodykit to match. All Leon STs are fun to drive, though, thanks to accurate steering, good body control and suspension that errs on the firm side, but it’s never uncomfortable. SEAT’s Drive Select driving modes will let you change the characteristics of the driving experience, too, so you can relax or really push it depending on your mood. 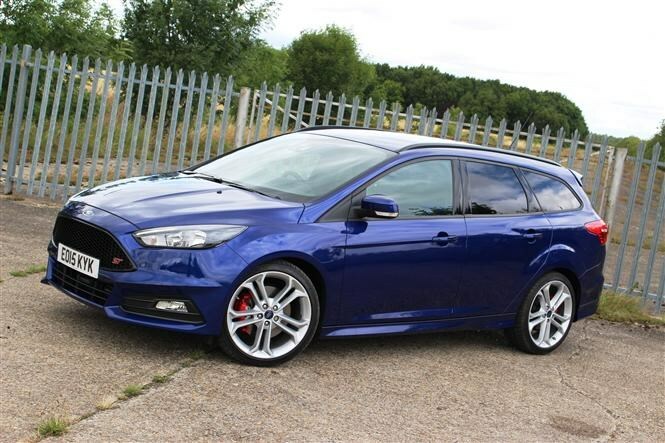 The Ford Focus ST is well-known as an involving hot hatch, but Ford has given it a dose of practicality and the choice of 250hp petrol and 185hp diesel engines. The petrol is a tempting choice for its extra power and great soundtrack, but it actually struggles for grip at times, so we think the diesel is better-suited to this model. Still, it looks suitably sporty, the steering is full of feel and it's easy to cover ground quickly. The boot can't quite match those of its Octavia vRS Estate TDI and Golf GTD Estate rivals at 476 litres, but it's well-shaped and has a wide opening. Yes, we know what you’re thinking. The MINI Clubman isn’t a practical estate car. Stick with us, though, because there’s a reason it’s made it into this list. Technically, the Clubman is an estate car – in fact it has six doors – but it’s the most practical version of a pretty impractical car and is the biggest MINI ever. It’s something potential buyers would be tempted by if they love the character of the hatch but need something a bit more family focused. With that in mind, it’s more of an outside choice if you’re thinking of getting a more traditional family hatchback like the VW Golf, but it offers an absolutely cracking driving experience. You don’t even have to buy the most expensive or the fastest MINI Clubman to enjoy driving it – all models benefit from sharp handling, accurate steering and impressive levels of grip. All engines are turbocharged and fun to use, but if you do want a bit more excitement, the Cooper S and JCW models are particularly characterful. The exhaust makes some great popping and crackling noises that will never get old if you’re a bit of a big kid. In terms of practicality, the Clubman has a 360-litre boot, accessed via a pair of side-hinged rear doors. If you opt for the Comfort Access option, these will open just by kicking your foot under the rear bumper. Like we said, the Clubman is far from being the most practical car on the road, but it’s an interesting alternative to normal hatchbacks that’s also great fun to drive. That’s why it’s made its way on to this list, and you may as well go for hot Cooper S spec. Many think once you have a family and reach middle-age, a sensible MPV is your best option for practical transport. But if you still want to have some fun behind the wheel and have a growing family, what are your options? For some, estate cars are all the car you’d ever need. Most offer plenty of space for the family and the associated paraphernalia of buggies, bags and baby seats, but they also need to be cheap to run, reliable and easy to drive. We’re adding an extra piece of criteria for this list, though – driving fun. Buying a sensible car doesn’t mean you can’t have a bit of fun behind the wheel, so the cars in this list are ones you can buy not only with your head, but ones that’ll put a smile on your face on a twisty country road. You can have as much or as little fun as you like thanks to a huge range of petrol and diesel engines and the availability of different driving modes. A particular highlight is the 335d xDrive which produces a huge 313hp and 630Nm of torque. The xDrive four-wheel drive systems provides amazing levels of grip, although we think the more sensible 2.0-litre 320d is the best option for most. It’s just as fun to drive and boasts attractively low running costs, proving that having fun doesn’t need to cost the earth. You can also opt for xDrive four-wheel drive across the range if you want. It’s got plenty of space and comes with some neat touches including 40:20:40 split-folding rear seats and an electric tailgate. If the 3 Series is simply too small, you can step up to the 5 Series Touring and still enjoy an involving driving experience, a spacious, high-quality interior and premium image. Despite its size, the 5 Series Touring is fun to drive thanks to direct steering and composed, engaging handling. It comes into its own on motorways, though, providing a relaxed and refined atmosphere whether you’re on your own or with the family in tow. The boot offers 560 litres of space, the rear seats fold flat and there are plenty of useful features like an electric tailgate, a useful selection of hooks and tie-down points and various packs that can make your life much easier. Audi has long struggled to compete with BMW in terms of driving fun and, while the new A4 Avant still can’t quite match the 3 Series, it’s the best one yet. There are plenty of petrol and diesel engines to choose from, including a rapid 3.0-litre TDI diesel with 272hp and Quattro four-wheel drive that will go from 0-62mph in just 5.4 seconds and just grips and grips in the corners. More sensible engines are available, as well as more performance-oriented models like the S4 Avant. Body roll is well contained in corners, so your family won’t feel like they’re being thrown around the luxurious interior, while luggage is secure in the 505-litre boot. Audi provides a bewildering array of optional extras and accessories, some of which we’ve got in the A4 Avant S Line we’re currently running. The current Mercedes C-Class Estate is the most enjoyable to drive yet. Granted, it’s no BMW 3 Series, but body roll is kept under control and the steering is sharp. The C-Class has five driving modes to choose from, just like its closest rivals, so you can choose if you want a more comfortable, something a bit more involving or something in between tailored to your preferences. The C-Class Estate is slightly smaller than the A4 Avant, but bigger than the 3 Series Touring. It has 490 litres of space, the seats fold completely flat and the boot opening is low and wide, making it very easy to load heavy and awkward items. The Mazda 6 is living proof that you don’t have to spend more to have more fun. 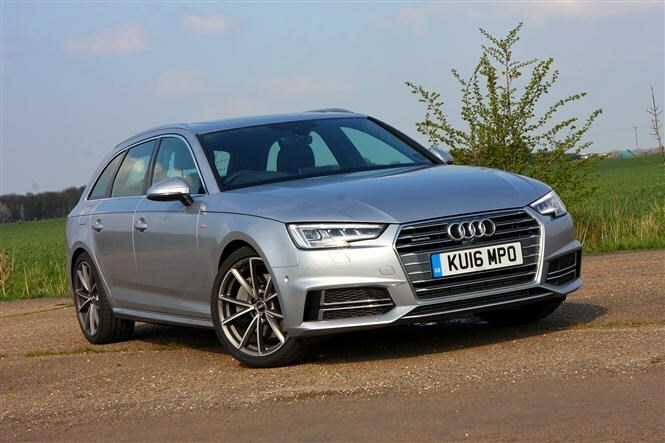 The 6 Tourer offers great value for money: it’s spacious – it boasts a 506-litre boot – it’s well equipped and the diesels should prove to be pretty cheap to run, too. There are some neat touches that will appeal to family buyers, including split-folding rear seats that can be operated from the boot via a simple catch, the load cover can be stored beneath the boot floor and a generous amount of storage areas throughout. On the road, the 6 provides engaging, composed handling in corners and the steering feels very precise. All models benefit from the same enjoyable driving experience, but the higher-powered diesel really makes the most of the car’s talents. We’d still go for the lower-powered diesel, though – it’s got the best balance of price, performance and low running costs. The SEAT Leon ST may be based on a car smaller than the Mazda 6, but it actually boasts an even larger boot, at 587 litres, so it’s a great option for buyers looking for style and space. It’s a wide and practical load space, too, with levers in the rear to lower the rear seats. There’s a huge range of turbocharged petrol and diesel engines to choose from, including a 2.0-litre TDI diesel with 184hp (it’s the same engine found in the VW Golf GTD), but if you want to have the most fun, there’s a Leon ST Cupra with a 290hp turbocharged petrol engine and a boisterous bodykit to match. Ordinarily we’d recommend the 1.6-litre TDI because of its low running costs, but for the purposes of this feature, we’d go for something with a bit of extra oomph. A high-riding Subaru estate car might not be the first to spring to mind as an engaging drivers’ car, but the Outback is something of a hidden gem and fits the bill for a practical, fun-to-drive estate very well indeed. The Subaru Outback is practical in all senses of the word. It’s got a huge interior for passengers, the boot is a spacious 510 litres (with extra under-floor storage) and it’s pretty handy when you venture off the beaten track and into the wild thanks to standard four-wheel drive. On the road, the Outback is good fun to drive, too. You can sense the car’s performance pedigree on the move, with impressive body control, communicative steering and plenty of grip. Surprisingly, the diesel isn’t much cleaner than the petrol in terms of CO2 emissions and fuel economy, so we’d go for this model as it’s cheaper and more responsive to drive. Technically, the Clubman is an estate car – in fact it has six doors – but it’s the most practical version of a pretty impractical car and is the biggest MINI ever – it’s something potential MINI buyers would be tempted by if they love the character of the MINI hatch but need something a bit more family-focused. In that mind-set, it’s more of an outside choice if you’re thinking of getting a more traditional family hatchback like the VW Golf, but it offers an absolutely cracking driving experience. You don’t even have to buy the most expensive or the fastest MINI Clubman to enjoy driving it – all models benefit from sharp handling, accurate steering and impressive levels of grip. Like we said, the Clubman is by far the most practical car on the road, but it’s an interesting alternative to normal hatchbacks that’s also great fun to drive. That’s why it’s made its way onto this list in hot Cooper S spec.